If you’ve got an abundance of fresh garden tomatoes, use them to make this wonderful Sausage and Basil Marinara Sauce. This amazing sauce freezes well and it’s perfect to eat over zucchini noodles for a meal that’s low-carb, gluten-free, dairy-free, and South Beach Diet friendly! Click here to PIN this tasty Sausage and Basil Marinara Sauce for the Freezer! If you happened to catch my final garden update this weekend, you know why I’ve been frantically making things like roasted tomatoes, Gazpacho, and now Sausage and Basil Marinara Sauce! My garden is simply overflowing with tomatoes. That means it’s time to make this sauce, my all-time favorite pasta sauce, and something I’ve been making for years. If you come to my house in the winter and open the upright freezer, you’ll see square containers like the ones below filled with this sauce. I’ll eat it served over Zucchini Noodles for a low-carb dinner, or with whole wheat spaghetti if I’m not as concerned about carbs, but this would be great with any type of pasta you prefer. And I never get tired of this favorite sauce. This is a very flexible recipe. I call for fresh tomatoes, but if you don’t have them available, you can use canned, diced tomatoes and still get a good result. I use turkey Italian Sausage most often, but pork sausage would taste great too. I used a combination of dried and fresh herbs for more depth of flavor, but you could still make a pretty good sauce even if you only have dried herbs. I add a lot of fresh basil, but if you don’t have a good supply of fresh basil like I do, you could get by with a lot less. But please, please, please, don’t skip the ground fennel. That’s one of the things that makes this sauce over-the-top good. And here’s an Instant Pot Chunky Pasta Sauce with Sausage, Tomatoes, and Herbs if you prefer that method! Add tomato sauce, canned tomatoes, dried basil, dried oregano, ground fennel, minced fresh garlic, and dried bay leaves to fresh tomatoes and simmer 1-2 hours. Brown turkey sausage well in a small amount of olive oil. Don’t rush this step. Add the sausage to the sauce, scraping out all the browned bits. Simmer 2-3 more hours. When sauce has thickened to desired consistency, add a generous amount of chopped fresh basil, a little fresh oregano, and a bit of olive oil and simmer 10-15 minutes more. This has reduced so much I actually put it into a smaller pan to get a better photo, and the flavor is great. If you’d like, divide the sauce into individual containers to freezer or to eat during the week! Use your fresh garden tomatoes to make this Sausage and Basil Marinara Sauce. 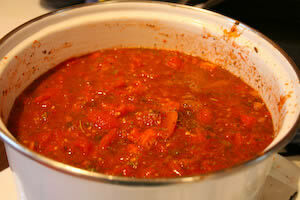 To peel tomatoes: Bring a deep pot of water to a slight boil. Wash tomatoes, then cut a V into the top of each tomato, cutting away stem area. 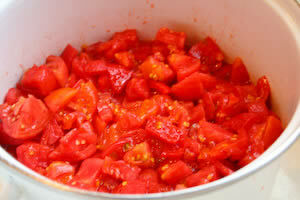 Put tomatoes with stem area removed into boiling water 1-2 minutes. Remove tomatoes to cutting board, and peel off skin, which should come off easily. If it doesn’t slip right off, leave tomatoes in boiling water a tiny bit longer. I do 4-5 tomatoes at a time, and usually let them cool for a minute or two before peeling them. Chop tomatoes and put in large heavy pot. 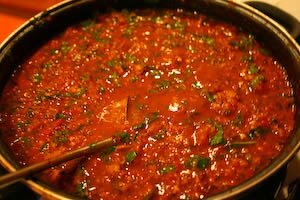 Add tomato sauce, canned diced tomatoes, dried basil, dried oregano, ground fennel, minced garlic, and bay leaves and let sauce simmer 1-2 hours. Heat 1-2 T olive oil in a large frying pan. 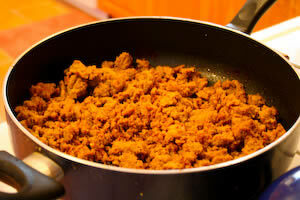 Squeeze sausage out of casing and brown, breaking up with heavy turner or potato masher, until sausage is well browned. Add browned sausage to sauce mixture and simmer 2-3 hours more. Add olive oil, fresh oregano and fresh basil to sauce and simmer 10-15 minutes. Let sauce cool before refrigerating or freezing. This sauce will keep for close to a year in the freezer if it is stored in a plastic container with a tight fitting lid. Every ingredient in this Sausage and Basil Marinara Sauce is friendly for all phases of the South Beach Diet and most other types of low-carb eating plans, although tomatoes definitely have some carbs. This would be perfect served over Zucchini Noodles for a low-carb meal or for South Beach Phase One. If you want nutritional information for a recipe, I recommend entering the recipe into this nutrition analyzer, which will calculate it for you. You can also sign up for a free membership with Yummly and use the Yum button on my site to save the recipe and see the nutritional information. « Previous PostWeekend Herb Blogging #47 Recap: What’s Cooking Where You Are? Amy, so glad you liked it. And I love the way you added more veggies! I LOVE this sauce! I have to admit I was a little leery about including the fennel and the bay leaves but they really bring out the flavor of the sausage. Although the recipe does not need anything else I did add some yellow and green bell pepper diced really fine(I think my family does not get enough veggies and try to add when I can), some of your slow roasted tomatoes diced, and a handful of chopped kalamata olives. I used a mixture of spicy and sweet turkey sausage but in hindsight I wish I used all spicy. Thanks so much for a sauce that I KNOW will become a family favorite! I personally don't think the crockpot will stay hot enough with the lid cracked to reduce the sauce, but it might depend on your crockpot. If you try it, let me know how it works. Could you crack the lid a bit to let it reduce? I would think it would work if you cooked on low for 8 hours or so. Just a thought if you can't be home to babysit it. I wouldn't make it in a crockpot, because it's the long slow simmering that thickens the sauce and adds flavor. You might be able to cook it part of the time in a crockpot though, and then put in a regular pan and simmer to thicken at the end. Hi. Can you do this in a crock pot? Thanks! I use 15 oz. cans. Looks like a great recipe! I was just wondering what size can you use for the canned tomatoes and sauce. I make the sauce exactly like this and then freeze it. You could add more fresh herbs when you reheat the sauce if you have them. I'm making your sauce and I'm wondering; If I am going to freeze the sauce should I still add the fresh herbs now or should I wait until I reheat the sauce and add it then? I have a huge pot of this on the stove that's been simmering for over four hours. It looks great. Can't wait to dive in. Regarding using all fresh tomatoes–I've been making my own fresh sauce at least once a week but it's never enough to freeze. By adding the Muir Glen, it gives me enough so that my family and I can't possibly eat it all within a day or two. Also, there's only so many tomatoes that I am willing to scald and peel in one day. Carl, you can definitely make it with all fresh tomatoes if you wish. I also have this recipe for Roasted Tomato, Italian Sausage, and Basil Sauce that doesn't use any canned tomatoes. This looks like a great recipe. I am just curious though … at this time of year where there are tons of fresh tomatoes on hand, why do you mix fresh tomatoes with can tomatoes in this recipe? Can't one just go with fresh tomatoes? Steve, you can certainly do it that way, but it wouldn't be my preference. I like the way the sausage flavors the sauce as it cooks. Your choice though, I'm always happy to let people adapt my recipes any way that suits them! Amber and Tom, sounds about right to me. Plus the measurements don’t have to be that exact for this. Ya know, I just read that one 14.5 oz can is about 2 cups of tomatoes. So I think I’ll estimate about 3 tomatoes in a can. I wonder if you’ll get this before I head to the store today. Approximately how many cans of diced tomatoes should I substitute for the fresh ones? I was thinking maybe 4? Hey Kalyn–I made this sauce yesterday, and followed your directions right down to the fennel. I couldn’t find whole Roma tomatos at the Whole Foods near me, so I went with the Muir Glen, as suggested. Results were astronomically good. Found your recipe through sheer chance when I googled “sausage marinara.” Your photos sold me, and I was completely rewarded for my faith. Had to impress a certain someone with long red hair yesterday, and did so handily thanks to your sauce. Bravo. Anonymous I can’t think of anything that would make this taste sour, unless it was the type of tomatoes you used. You could add sugar if you’re not a SB dieter. Otherwise I have no idea why that might happen. Mine has never been sour at all. I made the sauce last night, used chicken sausage instead, since I don’t eat turkey. I think my sauce turned out a little sour. I made the full recipie, can I add something else to it to decrease it’s sourness. I love using turkey sausage. My tomatoes are overflowing too so I have had a hard time even reading these WHB posts this week. I hate to miss reading them all. this sounds yummy! with all these great ideas for freezing veggies from our gardens, i’m going to have a bigger freezer! lol! That looks like great sauce there! I always feel “rich” when I have a freezer full of homemade sauce. It tastes so much better than any bottled sauce from the store, and it saves the day when you exhausted. What an awesome post! Gorgeous photos and I truly am jealous. Wish I had tomatoes growing in a garden. Thanks for sharing and I love fennel so now I have something else to add it to. As usual, your recipe looks good! Gosh Kalyn, this looks amazing! Genie, the fennel is a must! Tanna, you must have that BLT, and yes, get enough to make some sauce too. Mae, thanks. I’m sorry you don’t have tomatoes, but I don’t think they would survive mailing to Jersey too well. Christine, thanks. I just saw your great crab cakes recipe in the post about 5 favorite things, which I’m thinking is a must try. Bradley, thanks. And I’m excited you left a comment on the blog. I doubt the tomatoes would survive the trip by Fed Ex that well. Joe, aren’t the Glen Muir tomatoes just awesome. I like their pizza sauce too. I love Muir Glen tomatoes! Pretty much the only kind I use! I love all of the pictures. They are great. Can you FedEx some of those tomatoes our way. This sauce looks fabulous and I’m thinking will become my favorite. Thanks for the fennel tip and thanks for the recipe, Kalyn! I love the turkey sausage – I get mine at Whole Foods and have some in the freezer. But my garden has no fressh tomatoes. Should be able to find some at one of the local markets about now. Maybe enough to make my BLT also. Kalyn, this looks so very good…yum! I’ve never put fennel in my marinara, but I’m adding your recipe to the list to try, and will make sure that key ingredient is included.